Figure 1: Three examples of glacial geoengineering techniques to mitigate sea-level rise from ice-sheet melting [Credit: Adapted from Figure 1 of Moore et al. (2018); Design: Claire Welsh/Nature]. As the climate is currently warming, many countries and cities are preparing to cope with one of its major impacts, namely sea-level rise. Up to now, the mitigation of climate change has mainly focused on the reduction of greenhouse gas emissions. Large-scale geoengineering has also been proposed to remove carbon from the atmosphere or inject aerosols into the stratosphere to limit the rise in temperature. 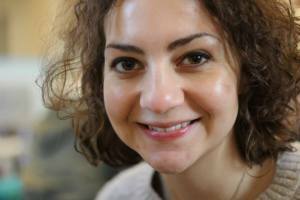 But locally-targeted geoengineering techniques could also provide a way to avoid some of the worst impacts, like the sea-level rise. In this Image of the Week, we present examples of such a technique that could be applied to the Antarctic and Greenland ice sheets (Moore et al., 2018; Wolovick and Moore, 2018). The sea level of the world oceans has been rising at a mean rate of 3 mm per year since the 1990s, mainly due to ocean thermal expansion, land-ice melting and changes in freshwater storage (see this post). More than 90% of coastal areas could experience a sea-level rise exceeding 20 cm with a 2°C warming (relative to the pre-industrial period), which is likely to happen by the middle of this century (Jevrejeva et al., 2016). The Antarctic and Greenland ice sheets constitute two huge reservoirs of ice and contain the equivalent of 60 and 7 m of sea-level rise, respectively, if completely melted. Although a complete disintegration of these two ice sheets is not on the agenda in the coming years, surface melting of the Greenland ice sheet and the flow of some major polar glaciers could be enhanced by different positive feedbacks (see this post on climate feedbacks and this post on marine ice sheet instability). These feedbacks would elevate the sea level even more than projected by the models. A. 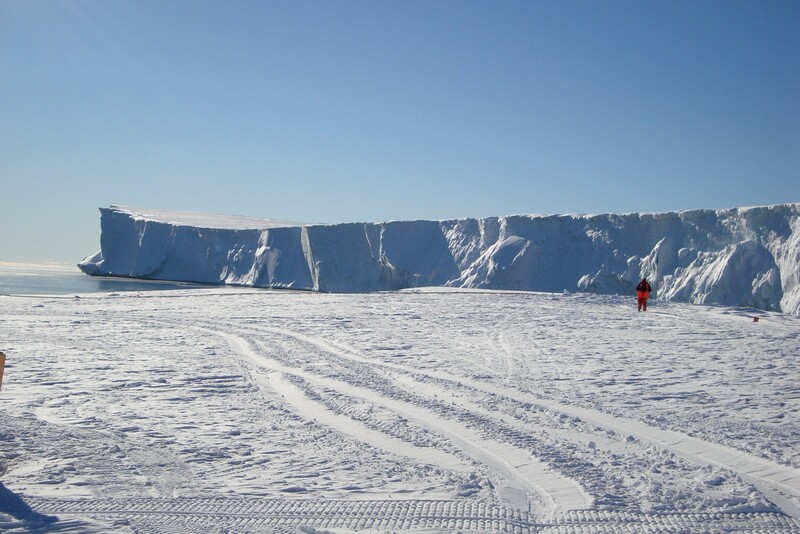 A pumping station could be installed at the top of the glacier with the aim of extracting or freezing the water at the glacier base. This would slow down the glacier sliding on the bedrock and reduce its contribution to sea-level rise. B. An artificial island (about 300 m high) could be built in the cavity under the floating section of the glacier (or ice shelf). This would enhance the so-called buttressing effect (see this post) and decrease the glacier flow to the ocean. C. A wall of up to 100 m high could be built in the ocean bay right in the front of the ice shelf. This would block (partially or completely) any warm water circulating underneath the ice shelf and delay the sub-shelf melting (see this post). 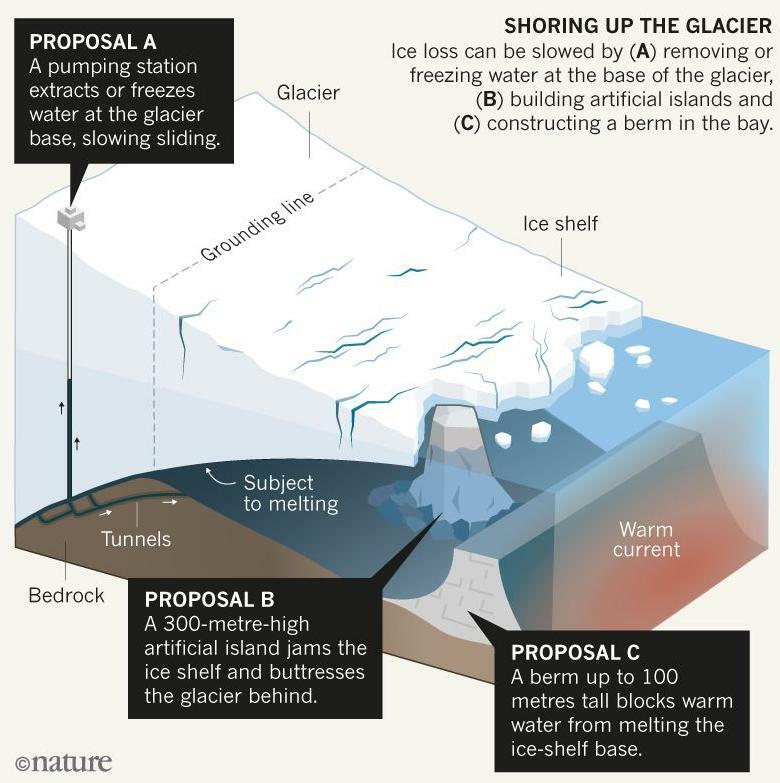 Wolovick and Moore (2018) studied in detail the possibility of building artificial islands (proposal B above) underneath the ice shelf of Thwaites Glacier (West Antarctica), one of the largest glacier contributors to the ongoing sea-level rise. They used a simple ice-flow model coupled to a simple ocean model and considered different warming scenarios in which they introduced an artificial island underneath the ice shelf. Figure 2 below illustrates an example coming from their analysis. In the beginning (Fig. 2b), the grounding line (separation between the grounded ice sheet in blue and the floating ice shelf in purple) is located on top of a small mountain range. When running the model under a global warming scenario, the grounding line retreats inland and the glacier enters into a ‘collapsing phase’ (Fig. 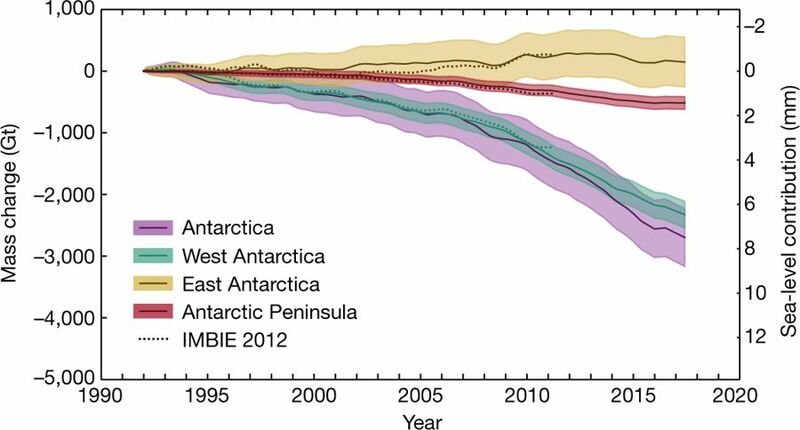 2c; marine ice sheet instability). 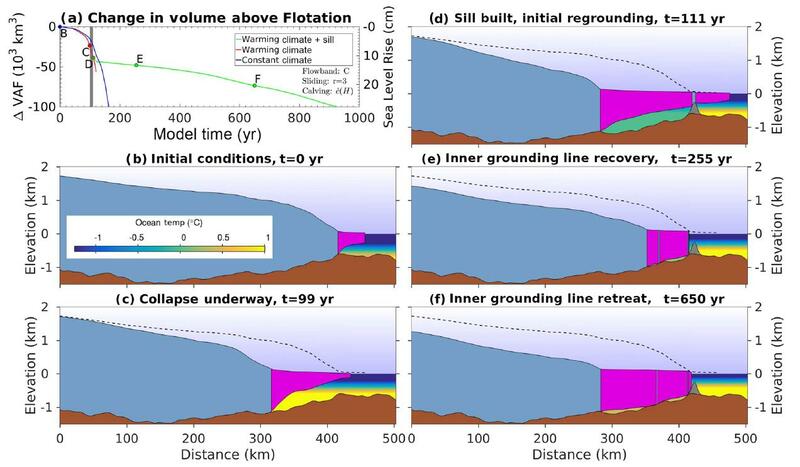 The introduction of an artificial island under the ice shelf with a potential to block half the warm ocean water allows the ice shelf to reground (Fig. 2d; the ice-shelf base touches the top of the small island below). The unprotected seaward part of the ice shelf shrinks over time, while the protected inland part thickens and regrounds (Fig. 2e-f), which overall decreases the glacier mass loss to the ocean. Figure 2: Example of a model experiment realized on Thwaites Glacier by Wolovick and Moore (2018). Different times are presented and show the (b) initial state, (c) the collapse underway, (d) the initial effect of the construction of the artificial island below the ice shelf, (e) the removal of the seaward ice shelf and thickening of the landward ice shelf, (f) the stabilization of the glacier [Credit: Figure 5 of Wolovick and Moore (2018)]. 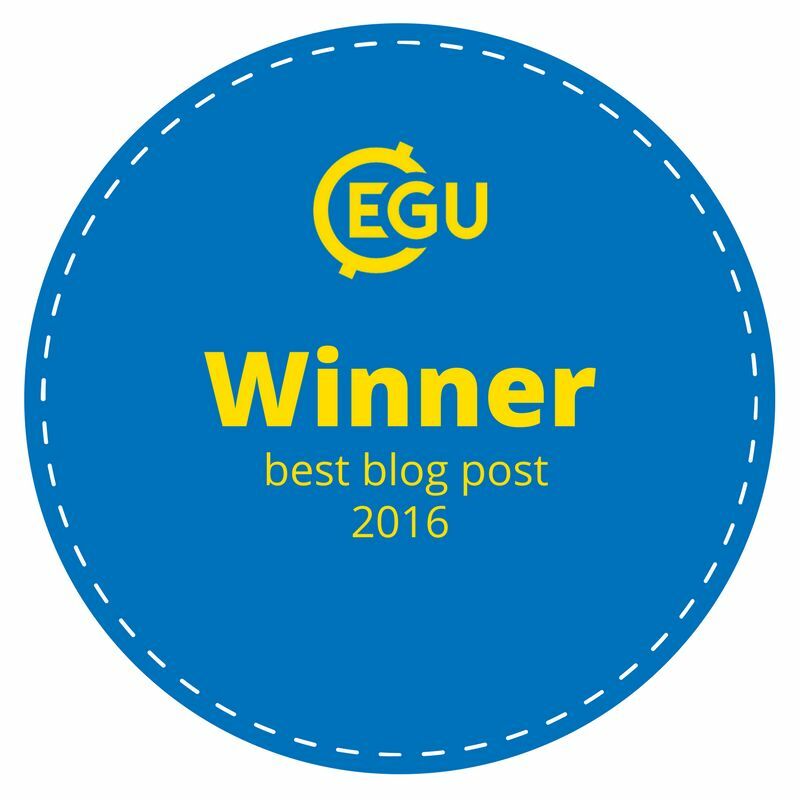 The model experiments presented above show that delaying sea-level rise from glacier outflow is possible in theory. In practice, this would mean substantial geoengineering efforts. For building a small artificial island under the ice shelf of Pine Island Glacier (West Antarctica), 0.1 km3 of gravel and sand would be necessary. That same quantity would be sufficient to build a 100 m high wall in front of Jakobshavn Glacier (Greenland) to prevent warm water from melting the ice base. For building such a wall in front of Pine Island Glacier, a quantity of 6 km3 (60 times more than Jakobshavn) of material would be needed. In comparison, the Three Gorges Dam used 0.03 km3 of cast concrete, the Hong Kong’s airport required around 0.3 km3 of landfill, and the excavation of the Suez Canal necessitated 1 km3 of material. Thus, the quantities needed for building glacial geoengineering structures are comparable in size to the current large engineering projects. However, many other aspects need to be considered when implementing such a project. In particular, the construction of such structures in cold waters surrounded by icebergs and sea ice is much more difficult than in a typical temperate climate. A detailed study of physical processes in the region of the glacier, such as ocean circulation, iceberg calving, glacier sliding and erosion, and melting rates, is needed before performing such projects. Also, the number of people needed to work on a project of this scale is an important factor to include. Beside all the factors that need to be considered to implement such a project, there is a list of potential adverse effects. One of the main risks is to the marine ecosystems, which could be affected by the constructions of the islands and walls. Also, if not properly designed, the geoengineering solutions could accelerate the sea-level rise instead of delaying it. For instance, in the case of water extraction (proposal A above), the glacier might speed up rather than slow down if water at the glacier’s base is trapped in pockets. Wolovick and Moore (2018) do not advocate that glacial geoengineering is done any time soon, due to the different factors mentioned above. Instead, they suggest that we start thinking about technological solutions that could delay sea-level rise. Other studies also look at different glacial geoengineering ideas (see this post). Glacial geoengineering techniques constitute a potential way to cope with one of the greatest challenges related to global warming, namely sea-level rise. In theory, these projects are possible, while in practice a series of technical difficulties and potential ecological risks do not allow us to implement them soon. While important to keep thinking about these solutions, the most important action that humanity can take in order to delay sea-level rise is to mitigate greenhouse gas emissions. And scientists like us need to keep carefully studying the cryosphere and the Earth’s climate in general. Moore, J. C., R. Gladstone, T. Zwinger, M. Wolovick (2018). Geoengineer polar glaciers to slow sea-level rise. Nature, 555: 303-305, 10.1038/d41586-018-03036-4. 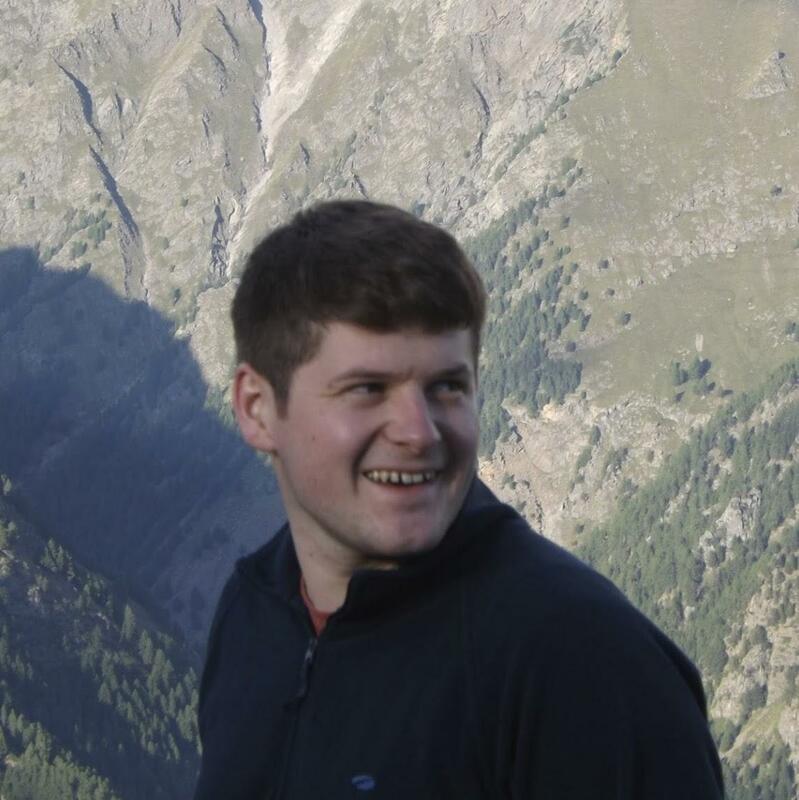 Wolovick, M., J. C. Moore (2018). Stopping the flood: could we use targeted geoengineering to mitigate sea level rise? The Cryosphere, 12: 2955-2967, doi: 10.5194/tc-12-2955-2018. Fig. 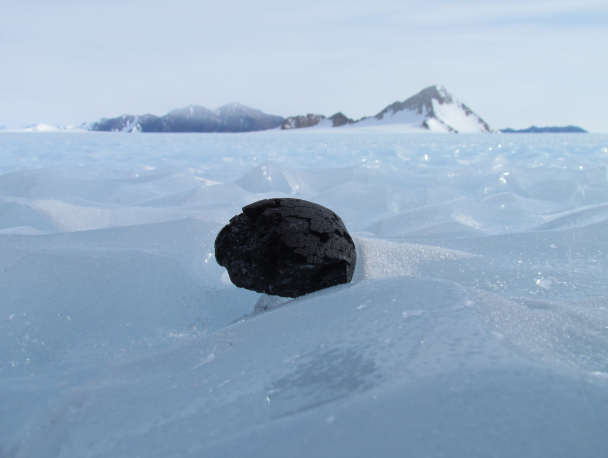 1: A meteorite in the Szabo Bluff region of the Transantarctic mountain range, lying in wait for the 2012 ANSMET team to collect it [Credit: Antarctic Search for Meteorites Program / Katherine Joy]. Last week we celebrated Antarctica Day, 50 years after the Antarctic Treaty was signed. 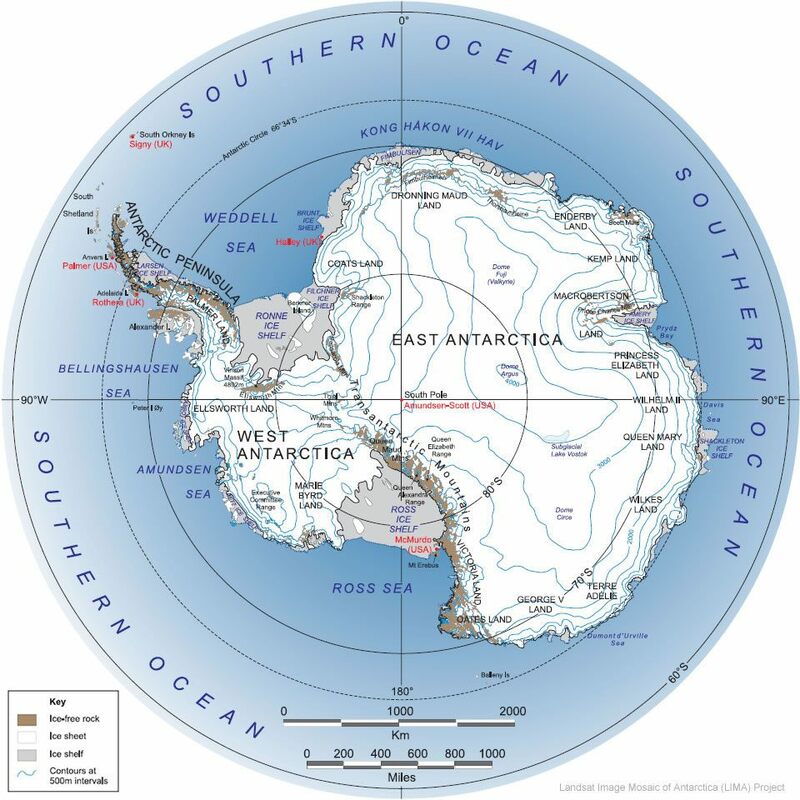 This treaty includes an agreement to protect Antarctic ecosystems. But what if, unintentionally, this protection also covered clues of life beyond Earth? In this Image of the Week, we explore how meteorites found in Antarctica are an important piece of the puzzle in the search for extraterrestrial life. Year after year, teams of scientists from across the globe travel to Antarctica for a variety of scientific endeavours, from glaciologists studying flowing ice to atmospheric scientists examining the composition of the air and biologists studying life on the ice, from penguins to cold-loving microorganisms. Perhaps a less conspicuous group of scientists are the meteorite hunters. Antarctica is the best place on Earth to find meteorites. Meteorites that fall in this cold, dry desert are spared from the high corrosion rates of warmer, wetter environments, preserving them in relatively pristine condition. They are also much easier to spot mainly due to the contrast between their dark surfaces on the white icy landscape (see our Image of the Week), but also because the combination of Antarctica’s climate, topography and the movement of ice serves to concentrate meteorites, as if lying in wait to be found. The targeted search for meteorites has taken place annually since the late 1960s, leading to the recovery of over 50,000 specimens from the continent, and counting. The most prolific of these search teams is the US-led Antarctic Search for Meteorites ANSMET), which lay claim to over half of these finds. Comprising only a handful of enthusiasts, this team camps out on the slopes of the Transantarctic Mountains for around 6 weeks hunting for meteorites. The finds include rocks originating from asteroids, the Moon and Mars. 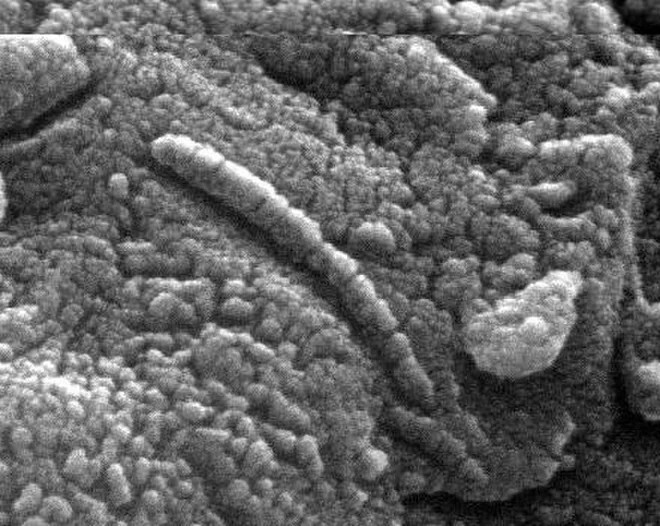 Evidence of life in a meteorite? There has long been a link between meteorites and the potential for life beyond Earth. Perhaps the most famous, or rather infamous, meteorite found in Antarctica is the Alan Hills 84001 meteorite (ALH84001). Found by the 1984 ANSMET team, this meteorite was blasted from the surface of Mars some 17 million years ago as a result of an asteroid or meteorite impact, falling to Earth around 13,000 years ago. This piece of crystallised Martian lava is roughly 4.5 billion years old. The reason for its infamy is the widely publicised claim made a decade after its discovery that it harbours evidence of Martian life [McKay et al 1996]. Specifically, application of high resolution electron microscopy unearthed microstructures comprising magnetite crystals that looked, to the NASA scientist David McKay and his team, like fossilised microbial life, albeit at the nanoscale (see Fig. 2). Fig.2: A nanoscale magnetite microstructure that was interpreted as fossilised microbial life from Mars [Credit: D McKay (NASA), K. Thomas-Keprta (Lockheed-Martin), R. Zare (Stanford), NASA]. Such a finding of evidence for extraterrestrial life has huge implications for the presence of life beyond Earth, a subject that has captivated humankind since ancient times. This extraordinary claim made headline news across the globe. It even gained acknowledgement by the then US president Bill Clinton. In the words popularised by Carl Sagan, “extraordinary claims require extraordinary evidence”, and this one garnered considerable controversy that endures today. At the time, there was no known process that did not involve life that could result in these types of structures. Subsequent research, triggered by this claim, has since indicated otherwise. The debate rolls on, and it seems we will never really know whether the crystals structures are fossils of Martian life or not, with no conclusive evidence on either side of the argument. Nevertheless, the interest and attention gained through this story kick-started a flurry of hugely successful Mars exploration missions, as well as reinvigorated the search for life beyond Earth. The ALH840001 is an unusual connection between meteorites and the search for extraterrestrial life. Much subtler, but more wide-reaching, is the potentially important connection between organic-containing meteorites and the existence of life elsewhere. The chondrite class of meteorites originates from the early solar system, specifically from primitive asteroids that formed from the accretion of dust and grains. They are the most common type of meteorite that falls to Earth, and contain a wide array of organic compounds, including nucleotides and amino acids, the so-called building blocks of life. In addition, a number of organic compounds that reside in these meteorites are also common on Earth, and are known to fuel microbial life by serving as a source of energy and nutrients for an array of microorganisms [Nixon et al 2012]. These meteorites have fallen to Earth and Mars for billions of years, since before the emergence and proliferation of life as we understand it. A significant quantity of these meteorites, and the organic matter contained within them, has therefore accumulated on Mars. In fact, owing to the thinner atmosphere of Mars, a larger quantity is expected to have accumulated there than on Earth, and with more of its organic content intact. It is a therefore a distinct possibility that these meteorites may play an important role in the emergence, or even persistence, of life on Mars, if such life has ever existed [Nixon et al 2013]. The search for life on Mars is very much an active pursuit. As we continue this search using robotic spacecraft, such as NASA’s Curiosity rover and the upcoming European Space Agency’s ExoMars rover, we seek to better define whether environments on Mars are habitable for life. But our understanding of habitability on Mars and beyond is defined by our knowledge of the limits of life here on Earth, such as the microbial lifeforms that can make a living on and under the Antarctic ice sheet (see this previous post), but also in terms of the chemical energy able to support life. The search for meteorites on Antarctica has an important role to play here, and long may the hunt continue. McKay, D.S., Gibson, E.K., Thomas-Keprta, K.L., Vali, H., Romanek, C.S., Clemett, S.J., Chillier, X.D.F., Maechling, C.R. and Zare, R.N. (1996): “Search for past life on Mars: Possible relic biogenic activity in Marian meteorite ALH84001“. Science 273: 924-930. 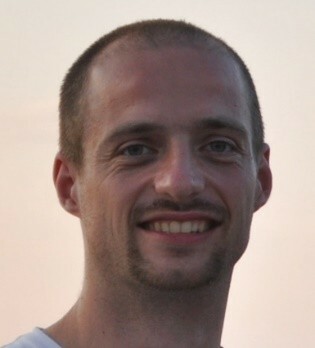 Nixon, S.L., Cockell, C.S., Tranter, M. (2012): “Limitations to a microbial iron cycle on Mars“. Planetary Space Science 72:116-128. Nixon, S.L., Cousins, C.R., Cockell, C.S. (2013): “Plausible microbial metabolisms on Mars“. Astronomy and Geophysics 54:1.13-1.16.